Your favorite new barista just may be a robot. PRISM is working with an inspiring new coffee company, Briggo, and they are planning to change the world of custom hot drinks with distinctively delicious coffee and tea brewed at self-serve kiosks. Briggo has already expanded from its Austin base and has ambitious plans for more new “coffee haus” locations in 2019. The company is committed to providing the highest quality coffee, which they trace from source to finished products, and lower waste production. Whether ordered remotely from their app or at the coffee haus, customers get fully customizable, gourmet espresso drinks on demand. 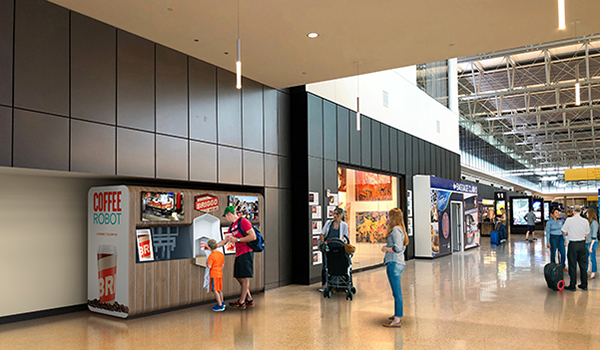 PRISM has produced some renderings to showcase how Briggo’s compact kiosks can work in their proposed airport locations. These coffee hauses have already been installed in a variety of settings like convention centers, offices, and in high-traffic outdoor areas. Fast Company magazine just listed Briggo to their 2019 Most Innovative Companies list. It’s the dawn of #connectedcoffee.